A popular preppy look during the warmer months is caning. Often referred to as lattice, this patten refers to a specific method of weaving widely used on furniture. An attractive, geometric pattern, caning lends itself well to a variety of applications. 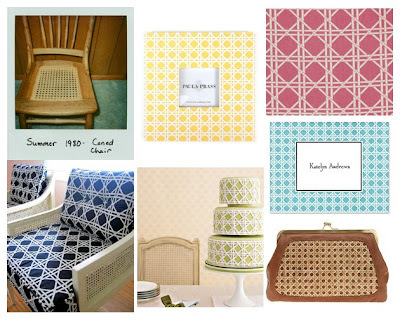 Chair Polaroid by A-wix, Paula Prass Lattice Frame, Waverly coral criss cross caning fabric, Boatman Geller lattice note card, Urban Outfitters Veranda caning clutch, Cane Cake from Lovin Sullivan, caned chairs [via d*s].